From its humble beginnings in 2011, the Amana Colonies Popcorn & Ice Cream Company has quickly become an Amana favorite. With over 60 unique flavors of popcorn, you are bound to find the perfect treat no matter what the occasion. We take pride behind our products, from the quality of our popcorn; to the recipes and ingredients, we only send out the best. Enjoy. 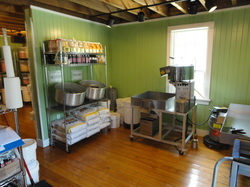 If you are planning a trip to Amana, please stop in and visit us at the Amana Colonies Popcorn & Ice Cream Company. Please visit our Amana Colonies Bakery & Cafe website!